This international gold review is a followup to yesterday’s message about maintaining control over your wealth. 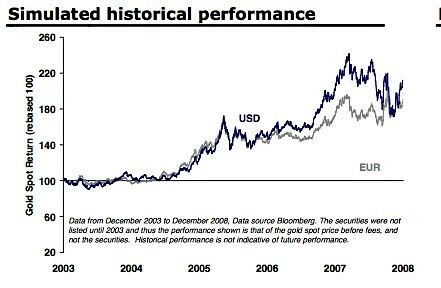 Jyske Global Asset Management just changed its gold position so we should take a new look at gold. Most major governments have deficits in their budget. This forces them to borrow or print money that is not backed by productivity. When this happens long term, the purchasing power of money created in this way, loses purchasing power. Any form of exchange must possess five qualities to be considered real money that will store value and purchasing power. These five values that money must be are durable, divisible, portable, desirable and rare. When a government creates a currency with no production to back it, then that currency loses its rarity and its purchasing power falls. Gold is one long term way to combat the risk of a falling currency. Gold is real money because it has all five qualities of real money. Make no mistake… when it is rare… paper money is better money than gold… because it is more divisible and portable. Electronic money available in a credit card is even better… the most portable and divisible of all… IF THE CURRENCY MAINTAINS ITS RARITY. Regretfully for the dollar, euro, yen and many other major currencies, this has not been the case… so gold still has a place in our portfolios. Gold as a commodity fits the five standards best of all and for thousands of years has been used as a form of money. In a moment we’ll look at what might happen to the price of gold in the months ahead. First, because many readers have asked about bringing gold into Ecuador, I checked with out attorney Andres Cordova in Quito. Here is his reply: Dear Gary: After reviewing applicable legislation, we’ve found that there is no restriction on the introduction of gold or coins to Ecuador. The introduction of such, however, does carry a tariff that is to be charged in accordance to weight or monetary amount. Furthermore, there’d need to be a customs filing in which the gold presentation is to be declared, such as ingots, jewelry, dust, etc. Furthermore, an explanation of where does such gold / coins come from needs to be consigned in such form. If gold is brought with the traveler, then such must be specified in the customs form that each passenger gets before landing in Ecuador. For those that want physical gold in Ecuador, there is gold mining in Ecuador and are gold dealers. I do not know any personally. But there are many places with signs that they buy gold. I am researching this and will post a password protected message for our Ecuador Living subscribers. You can subscribe to Ecuador Living so you’ll receive this report when it is published. There are three other ways to hold gold than in bullion and coins. These alternatives are less expensive than bullion and avoid the hassle and dangers of carry heavy, valuable precious metals on your person and across borders. Plus they avoid this Ecuador tax. We’ll review these options after we examine what might happen to gold’s price in the days ahead. When gold breached the $1,000/oz mark in February of 2008, the mass media were full of reports of unprecedented coin demand and long wait times for bullion buyers. You couldn’t open the paper without seeing a piece about the gold rush. Sales of the Austrian Philharmonic gold coin soared 544% in the first two months of 2009 (vs. the same period the year before), with production at the country’s mint running quadruple its usual volume. The demand for Krugerrands is at its highest level since 1986. The South African refinery recently doubled production of blank gold coins to 20,000 ounces per week. China, now the fastest-growing market for gold, saw 2008 sales (measured in dollars) rise by 50% over the year before – and total sales in January 2009 were one billion yuan (US$146 million), 30% more than all of last year. The U.S. Mint sold 193,500 one-ounce gold Eagles in the first seven weeks of 2009 – equaling the number shipped in all of 2007 and about matching the first half of 2008. Swiss banks just reported they are running out of secure storage space for gold bullion held by investors and institutions in their vaults. I have worked with Michael Checkan at Asset Strategies International, Inc. for many decades and any time I think of gold, I think of him. Michael’s firm offers one of the the three gold alternatives… Precious Metals Certificate Programs. Precious metals can be purchased and stored on your behalf through the Perth Mint Certificate Program. This program offers storage for gold, silver, and platinum at the Perth Mint in Western Australia. This is the only government guaranteed precious metals program in the world… fully backed by the government of Western Australia, and has operated continuously from the same location for over 100 years. This is an easy and low cost way to hold metals overseas. You can learn more about these certificates from Asset Strategies with a toll-free call 1-800-831-0007 or 301-881-8600 or visit their website www.assetstrategies.com. See an interview with Thomas Fischer of Jyske Global Asset Management and Rich Checkan of Asset Strategies here. Jyske Global Asset Management (JGAM) agrees that gold is a good asset now. All of JGAM’s portfolios were overweight in gold last time I reviewed them. . The low risk portfolio had about 5% in gold…. medium risk about 9% and the high risk portfolios were holding about 15% gold. However JGAM does not invest in physical gold or even undivided bullion. They invest in the ETFS Physical Gold shares. This is a share traded mainly on the London Stock Exchange (code PHAU) but also trades on Deutsche Borse (Xetra), NYSE-Euronext, and Borsa Italiana. Custodian (HSBC Bank USA N.A.). All the gold held are good delivery bars. This is a very practical way to own gold, because you can buy the shares direct from any stock broker. The shares are transferable or sold in the market. These shares trade on the stock markets just like an equity and their pricing and tracking operate similar to an Exchange Traded Fund except the share tracks the price of physical gold, not a portfolio of equities. Here is the five year simulated price of these shares from the fund’s fact sheet. Other ETfs that invest in physical gold are SPDR Gold Shares (GLD) listed on the New York Stock Exchange in November of 2004, and traded on NYSE Arca since December 13, 2007, as well as Singapore Stock Exchange, Tokyo Stock Exchange and the Stock Exchange of Hong Kong. Here is a chart of the SPDR five year performance. Another ETF that invests in gold is iShares Comex Trust (IAU). I have just competed a full gold report for our multi currency subscribers that provides a third alternative to gold bullion and coins. In the multi currency gold report, I describe the recent change in JGAMs gold position, the profit they made and how Jyske Bank Private Bank and Jyske Global Asset Management can buy gold alternatives. You can subscribe to our multi currency service and get this report here. Deficit spending by the major governments around the world has reduced the integrity of the world’s currency system. All currencies risk losing purchasing power. Gold long term is one way to combat this risk. Join us with Jyske. Learn more about global investing, how to have an international business and diversification in Ecuador at the seminar. October 16-18 Ecuador Southern coastal tour (early sign up before Sept. 1, $499 per person).